Reaping the benefits of REAL FOOD! And supporting local farmers along the way. One of the things I really try to impress upon other mums and dads is how obtainable and affordable REAL FOOD is. Yes, even for your family! It is all about finding out where and how but once you do, there is no turning back! For us here in Cairns, Far North Queensland Australia, the RealFood Network is one main organization helping families and also the local community and everyone benefits. Why do I impress upon it so much? + reading the fun signage on every food display! Want to know my top tips? 1. Always head FIRST to the Realfood Network stalls (situated at the Grafton St end of Rusty’s Markets. Note: Rusty’s Markets are on every weekend in the city of Cairns from 6am Fridays – 3pm Sundays) OR to your preferred local market stall in your area. 2. 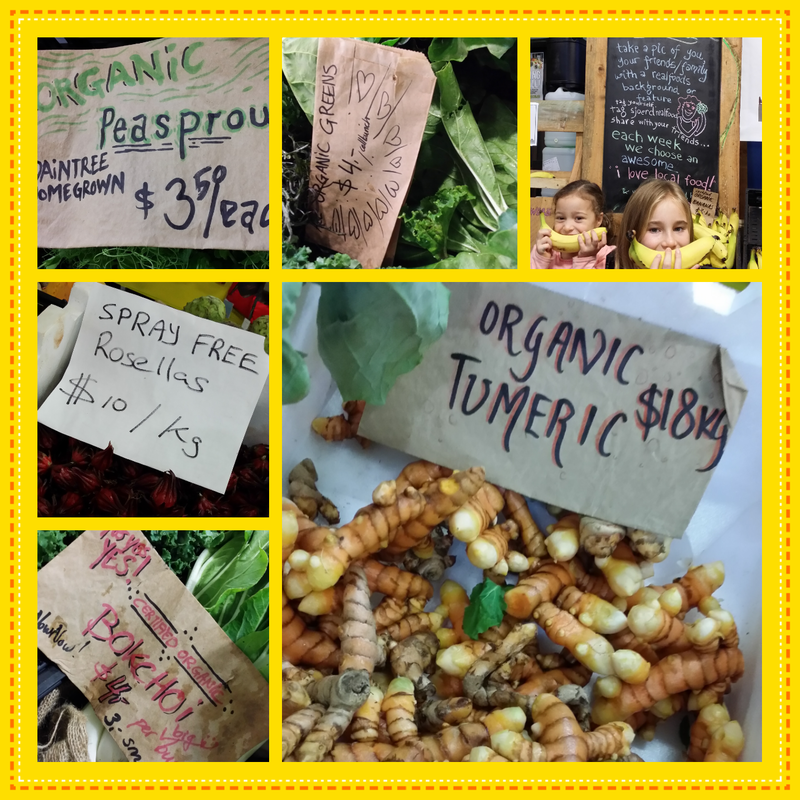 If you get time beforehand, do a quick scour around of other stall prices so you can compare (remembering that these may not be organic/pesticide-free/local/fresh produce). 3. Start off slow and buy produce that you are used to BUT with the addition of trying something new every week that you haven’t tried before or don’t normally eat! Even if it’s just 2 single rosella buds like I did the other week. 4. Supplement the rest of your weekly fruit and vegetables via your normal shopping methods with the intent of increasing your fresher organic/spray free produce each week until this is primarily all you are doing! 🙂 Some mums and dads I have helped to get on this journey have been amazed and pleasantly surprised at just how comparable (and sometimes even cheaper!) the prices are versus produce at other stalls! Yay! Keen to give it a go? Head on in and get chatting to your passionate team at your ‘RealFood Network’ or similar in your region and you are on your way! And remember, the more families that get on to this, means increased demand, calling for an increase in supply (which will provide more support to our local farmers) and best of all, will bring prices down! Everyone wins! For us in Cairns, RealFood Network also do weekly food boxes and have weekend specials! Be sure to mention Healthee Living when you go! 😉 For more information on Realfood Network, click to their link http://www.realfoodnetwork.com.au/ or contact me for more information. You can also join me on my Facebook page where I share recipes and tips with the produce that I buy each week to help you get them in to your families too!